Happy Labor Day weekend! I may be doing a little happy dance that this is a sign of cooler days ahead, but I’m definitely going to miss summer fruits and veggies. Peaches, cherries, watermelon, artichoke, and so many more. I love the seasonal summer fresh foods, but the typical summer gathering featuring hotdogs, sodas, and chips are a bit of a war zone for any following the autoimmune protocol. Whether you’re tempted by your favorite indulgences in a past life, or are just darned hungry at your labor day BBQ this weekend, I’ve got a dessert recipe for ya! 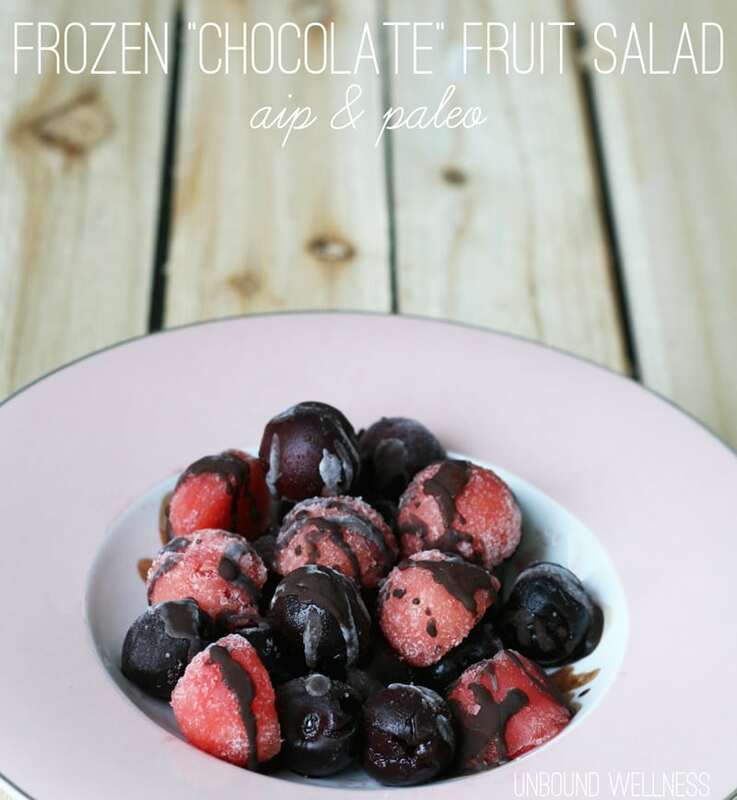 AIP desserts can be cumbersome to prep, but this frozen chocolate fruit salad with cherries, watermelon, and carob sauce is a sweet, no-cook dessert that you probably won’t want to share. 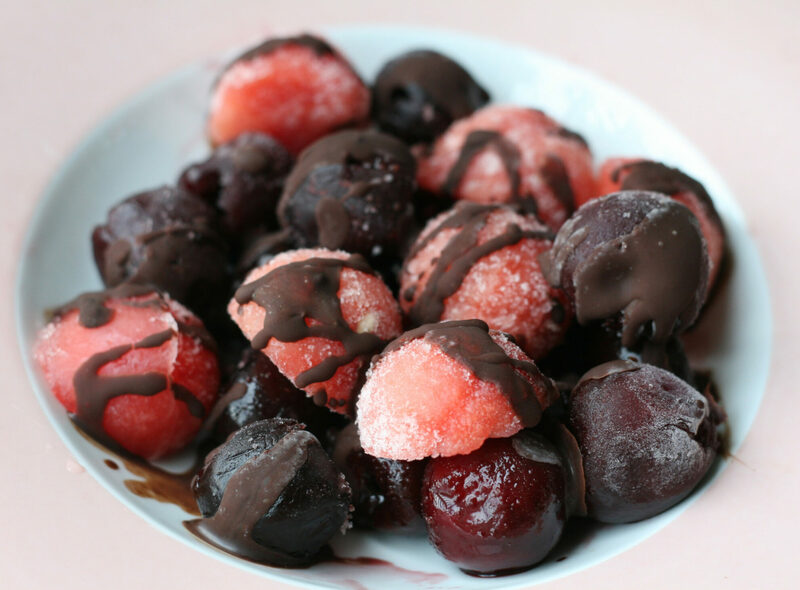 Freezing the fruit makes for a refreshing touch, and how can you ever go wrong with anything slightly resembling chocolate? The only prep that this requires is actually freezing the fruit. You can buy frozen cherries, or just throw fresh ones in the freezer. Using a cherry pitter makes for a more pleasant eating experience. As for the watermelon, the melon baller is my best friend. Keeping these in the freezer for 12 hours will be more than enough time to get them frozen. A chocolately, frozen, and easy, and AIP dessert? 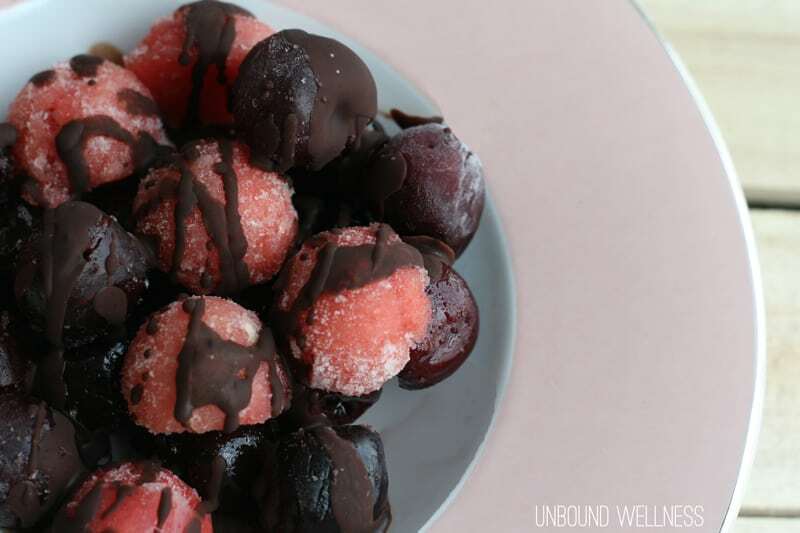 Not only is a perfect labor day snack, I’m going to have to keep some extra frozen watermelon and cherries in the freezer before they all disappear! This may be a fun summer send off, but I’m actually already in pumpkin mode. I’m sending out this AIP Pumpkin Spice latte recipe to my email list early, tomorrow! Sign up for my email list to get the AIP Pumpkin Spice Latte Recipe before it goes up on my blog! What are you up to this labor day weekend? Excited for all things fall yet? This recipe was shared on the Phoenix Helix AIP Recipe Roundtable. Be sure to check it out!